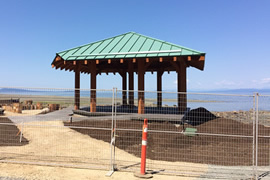 This Streamkeeper Project includes: The new covered “Pavilion” with extensive interpretive signage including Qualicum First Nation Heritage, mandates of the Mount Arrowsmith Biosphere Region and Parksville Qualicum Beach Wildlife Management Area, highlights of the incredible biodiversity in local fauna, including Marine Mammals, Shore Birds, Fish and Beach Life. There will be a special focus on Faye’s Legacy and Wild Salmon. 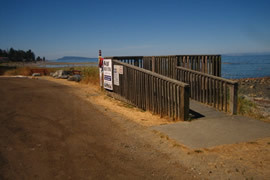 In addition, the interpretive signage at nearby Grandon Creek will be upgraded. Our original target was to raise $90,000 which we have achieved. However, we are experiencing some unanticipated costs are are continuing to accept donations to this memorial to Faye. Your donation is tax-deductible. A tax receipt will be issued for all donations. Our charitable registration number is 86594 7287 RR001. For more information about Faye's contributions to our community, click here. For a status update on the project, click here. Alternatively, if you wish to support general Streamkeeper projects, you can donate online through the Canada Helps button below, or mail a cheque payable to Qualicum Beach Streamkeepers at the address noted above.